Some time ago I did Battlefield 4 kill distances post which aimed to answer question at what distances Battlefield 4 (BF4) soldiers manage to kill other soldiers (and by rough extension, what are the engagement distances). Following this we decided to do the same for Battlefield 1 (BF1). Compared to BF4, the methods used to gather the data are more sophisticated. The post-processing/analysing also includes additional steps to remove e.g. bias caused by some maps being more common than others. Using total of 2000 recorded kills per map (BF1 vanilla maps + Giant's Shadow) from multiple rounds. 2000 samples were randomly sampled from larger set of records per map. We could also "patch around" bias from uneven distribution of the weapons, but the goal of numbers shown here is to reflect average game of BF1, including the players' taste for certain weapons or weapon classes. I.e. these numbers reflect what a BF1 player should experience on average while playing any of the maps. 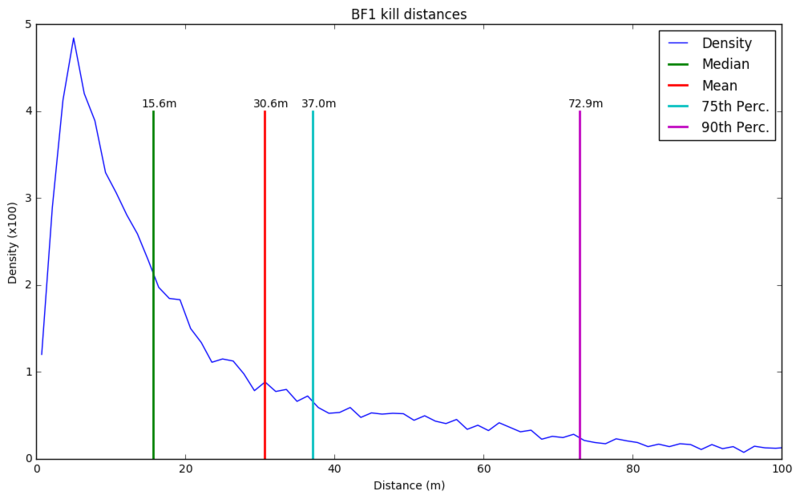 Following plot displays density function of the kill-distances, i.e. how large fraction of players were killed at given distance. Mean, median, 75th and 90th percentile are also included in the image. "Xth percentile" means point where X% of the density is below that point. E.g. In this plot 75th percentile is distance below which 75% of the kills happen. More than half of the kills happen at under 20m, with high number of kills focusing at around 5-10m and a long tail going well above 100m (max was 428m). 90% of the kills happen at under 73m. The popularity of SMG (close-range) weapons could partly explain this. 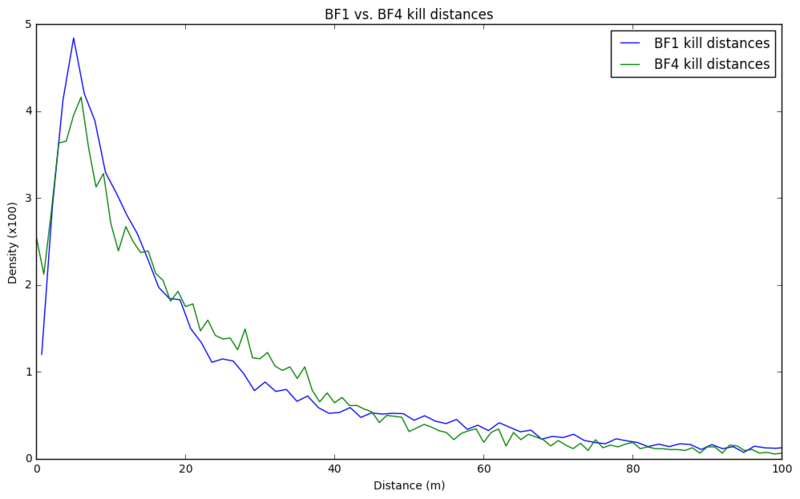 Comparing to BF4, BF1 shares very similar kill-distance density graph and summary values. See more on this few headlines down. Some of the maps have vividly different themes: One has lots of open area while another takes place in a city. To study these ranges we can calculate statistics per map. There's clear difference between some of the maps: Fao Fortress (mountains) has roughly 20m higher 75th percentile than other maps (minus Suez). Interestingly Suez (desert urban-ish) has the second largest kill distances, beating Desert map (desert with lots of open area) by 10m in 75th percentile and 15m in 90th percentile. At the other end of the spectrum, Amiens (city) and Forest (thick forest) have more than 90% of the kills happening at under 50m, which is below optimal range of longer range snipers such as M1903 and Gewehr 98. Note: BF4 analysis was done slightly differently, e.g. it included gadgets and melees, and did not 'fix' map unbalance. As such these results should be taken with a pinch of salt. Since we have very similar analysis done on BF4, we can compare these results. Along with comparing summary-statistics like mean and median, we can plot the densities in same plot. Studying the graph, BF1 has lower fraction of kills at distances 20-40m but slightly more at above 40-80m. Using the numbers from BF4 post, mean distance for BF4 is 35m and median is 17m. BF1 has mean of 30.6m and median of 15.6m, both of which are lower than for BF4. While this could indicate that kills in BF1 happen at closer range than in BF4. It should be noted again that BF4 had different methods for gathering and analysing data. However there does not seem to be any exceptional difference between BF1 and BF4 kill distances. 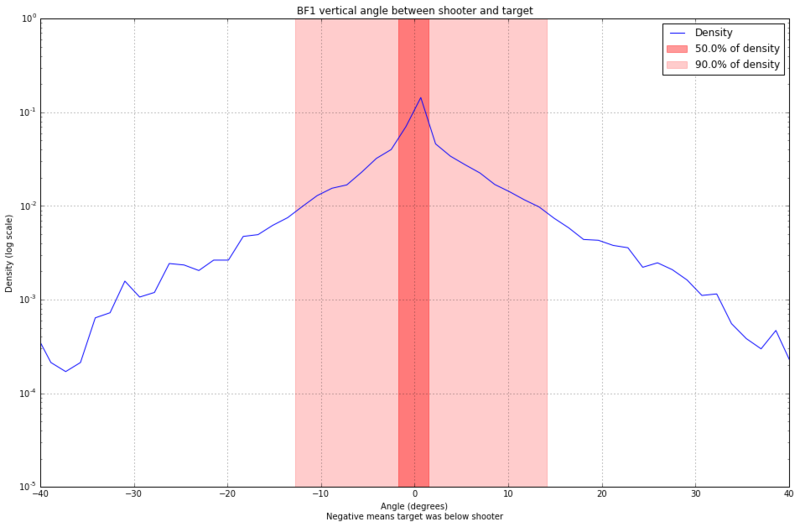 We can also analyse what is the vertical angle between shooter and the target. This "vertical gameplay" where soldiers could have very different heights (e.g. player on a skyscraper and another on ground) spurred some discussion during BF4. Following plot illustrates density of angles between shooter and the target, from the point of view of shooter. Negative angle means shooter had to aim downwards. 50% of kills happen between vertical angles -1.7 and 1.5 degrees, while 90% happen between angles -12.8 and 14.1. This was calculated by removing (1-0.5)/2 and (1-0.9)/2 of the density from both sides. Slightly more than half of the kills happen inside 2 degree vertical deviation from horizontal line. At 37m (75th percentile of kill-distances) this translates into total of 2.6m deviation which is roughly 1m more than soldier's height. this would mean kills happen slightly more often uphill (shooter aimed upwards) than downhill. Most BF1 infantry-on-infantry kills happen at under 20 meters from shooter to target. 90% of kills happen at under 73m. No exceptional difference from BF4, there seems to be less kills at 20-40m range and more on <20m and 40-80m range. Clear differences in kill-distances between some maps. Median ranges from 12m to 25m, while 90th percentile ranges from 42m to 153m. Majority of kills happen at "horizontal" level. I.e. Shooter and target were on similar height. More than half of the kills happen inside -2 to 2 degree vertical angle. One could plot out "kill locations" what was demoed in BF4 kill distances post. Maybe a more refined visualization could show something interesting. Kill distances per weapon (class). Problem here is the possible lack of datapoints for some weapons, but this could show if weapons' have overlapping "kill ranges". Engagement distances / effective engagement distances. For example, we could track damage done instead of kills. This could be used to analyze weapons' effective range. 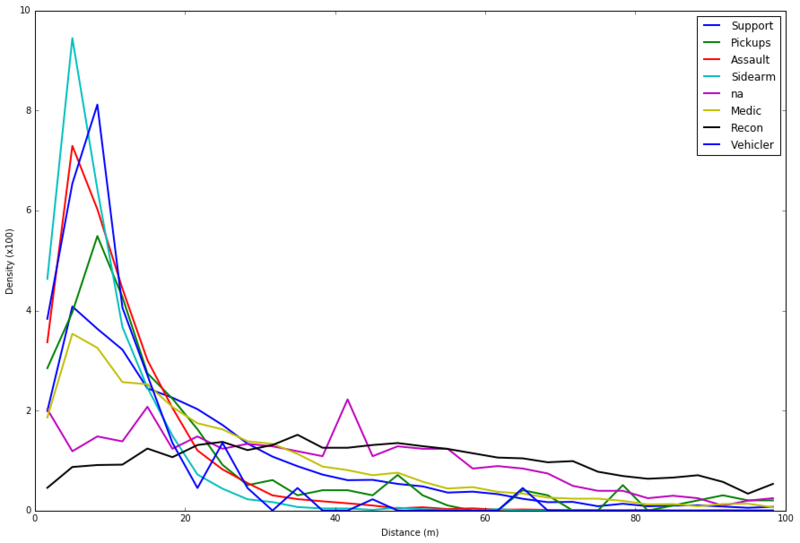 Refining this kill-distance study by removing biasses caused by weapons and whatnot. elementofprgess - For doing a lot of the work behind all this. <3! shellBullet at unknowncheats.me - For providing info that made our job easier. Class "na" can be ignored, as it contains all non-infantry weapons and gadgets. Sorry for the confusing colors! Sidearms and vehicle-r (pilot and tanker) weapons kill most at close range, which is to be expected given weapon types (pistols, small SMGs). These are followed by Asssault class, which is also focused to close range (SMGs, Shotguns). Medic (semi-auto rifles) and Support (LMGs) share very similar ranges in both summary statistics and density plot. It would be interesting to know what kind of differences there are between engagements of these two, as their weapons differ quite a bit. Recons have flat density curve compared to other weapons, soft peak around 30-50m. This flatness could be partly explained by how some snipers have high damage at ranges 40m-120m, but some start with highest damage like rest of the weapons. I just love things like this. Does that account for kill assists as well? With the new changes to the BAs, I wonder if the result would be different if you counted for average hit distances. Very nice work and summary again, very comprehensible, too. Sadly it is only pure kills (as in "Enemy killed"), so indeed this can't be taken as direct "engagement distance density". It would indeed be nice to get hits and/or "damage-done"s so we could start analysing how weapons function at distance on average, and how they relate to stats. For future work, I could even break down scoring by maps. For example, on the desert maps, the 1906 is going to score very highly if the mean kill distance is 50 m, whereas on a map like Argonne, I think the 1907 Factory will come out on top with it's average kill distance of 17 m. While these are kind of obvious results, the math might yield some interesting surprises (e.g. the Cei Rigotti and RSC are better than everyone thinks!). Note though that these results are biased by popularity of SMGs and whatnot. To get something like "at what range players are accurate" we would have to do ton more tweaking . But the core idea of your thing is interesting. I once thought about this too but never got time to do it. It would work much better with engagement distances / "accuracy distances" (accuracy plotted against distance). FANTASTIC! I will update my results and shoot you a link. Amazing how much killing gets done inside of 17m. I want to note that all of my scores are based on hit rater statistics, so I am to some degree taking into account accuracy. ... Which weapons perform best out to 37m ? Just in case I wanna cheese. No guessing, only SCIENCE! (But actually you were correct!) Three plots, one with raw effective TTK and KPR, one with weapon scores at range increments, and a third with an aggregate score weighted by the above engagement distances. Scores are calculated based on an equal weighting of effective TTK and KPR (kills per reload) from hit rater with bullet velocity included. 1) The top weapon by my scores is still the Autoloading 8 Factory because of it's incredible TTK during 80% of engagements. 2) The RSC is #2, because it has a similar TTK to the Auto 8 most of the time, but more killing potential in a 2v1 engagement. This is the balanced choice. 3) The M1916 is #3, because you fire an endless amount of bullets. 4) The Cei Rigotti is #4 - another well balanced choice under 37 m.
5) If ALL you need to do is kill stuff under 27 m, use the 1907 Factory. However, you have only a hope and a prayer of getting a kill after that. 6) If ALL you need to to is kill stuff over 40 m, use the Luger 1906. You still have a hope and a prayer up close, unlike the more specialized 1907. 7) The Autoloading 8 Extended is kind of bad unless you are within 17m (effective TTK is the same as the M1916 at 20 m!). 8 ) The Mondragon is kind of good and bad at nothing in particular. Pretty safe choice, not going to do work for you, though. 9) I have the data for the Mondragon Storm. It is never better than the Mondragon Optical. This post has been edited 9 times, last edit by "InterimAegis" (Mar 20th 2017, 9:39pm) with the following reason: Updating statistics, improved graphics. Woo~. M1907 Trench is even better as you don't have to aim to be (relatively) accurate .